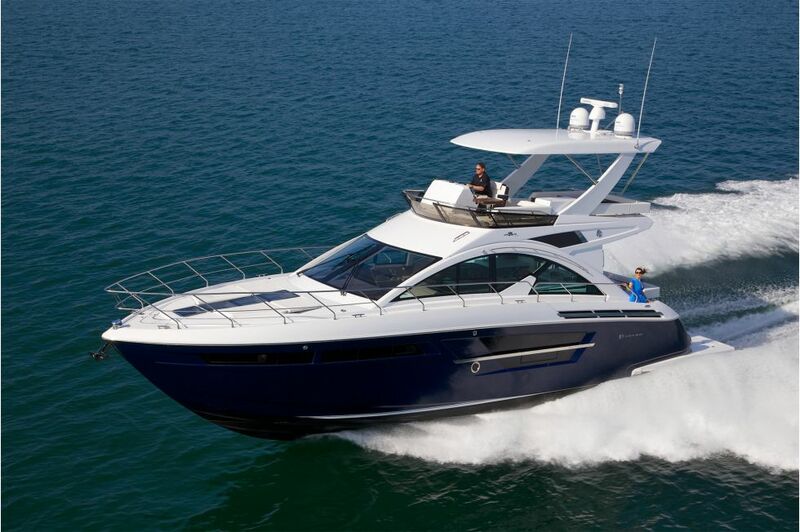 Experience elevated luxury and an unparalleled view from the Flybridge of the 54 Fly. 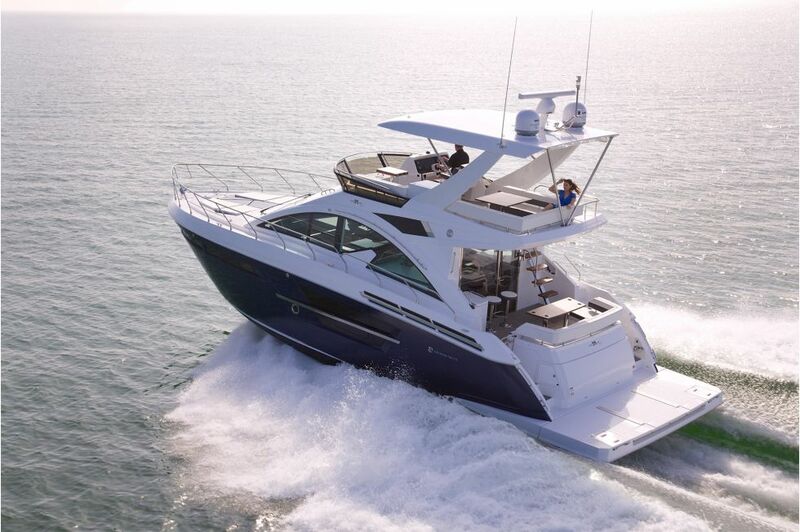 With plush seating, a built-in grill and wet bar for entertaining, and a hard top for absolute protection from the elements, the Flybridge is the perfect place to socialize with friends while taking in the horizon from a heightened perspective. The ultimate entertainment area, the 54 Fly Cockpit is decked out with premium accommodations to meet all your entertainment needs. Enjoy luxurious wrap-around seating and a large settee that can be used as one large entertainment area or split to become two pieces. 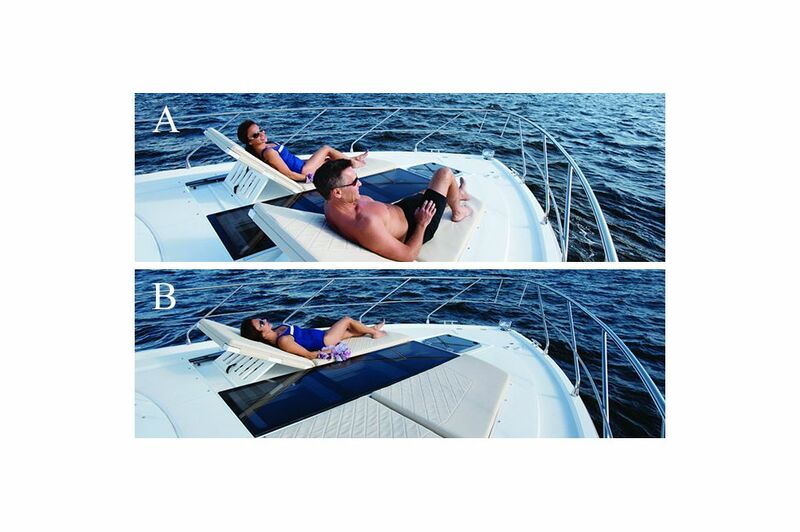 What's more, the Cockpit includes an electric hi-lo table that can convert into a sun lounge or rise for cocktails. 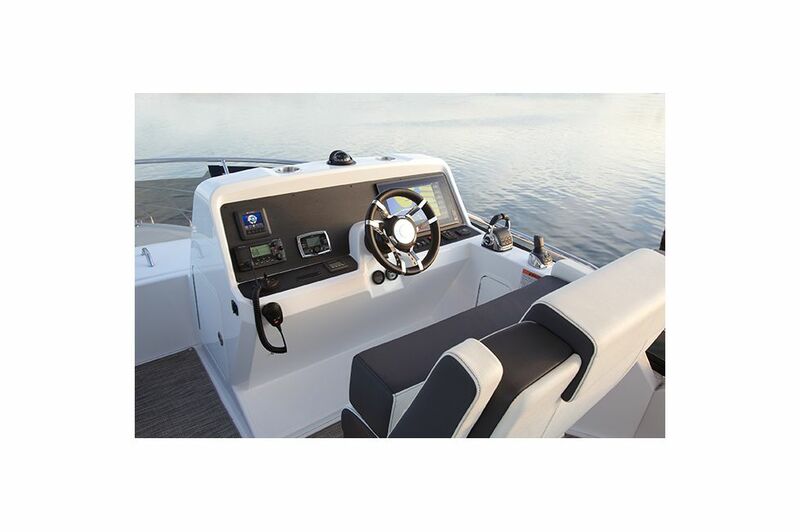 With superior versatility, the Cockpit is the optimal choice to entertain all your guests. 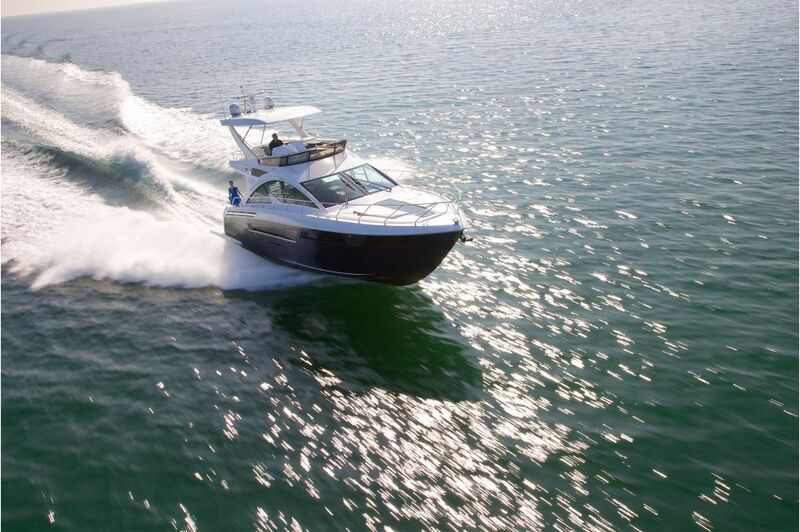 Freedom is at your fingertips as you start towards the horizon in the ultimate 54 Fly Helm. 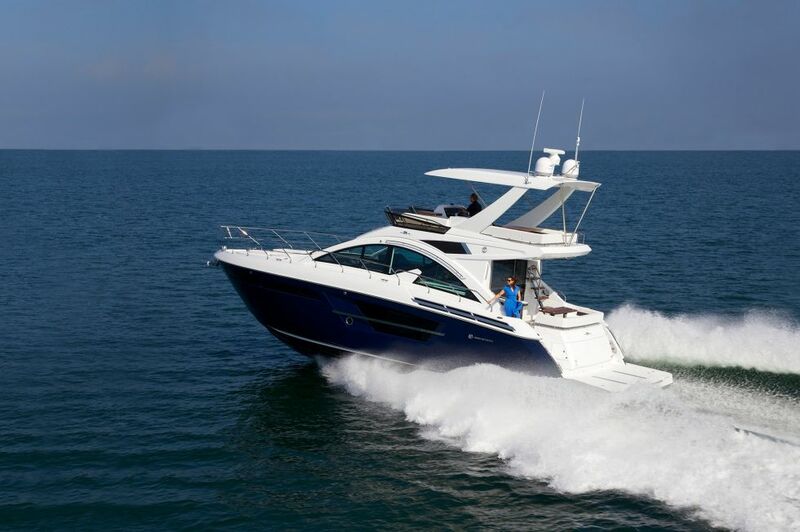 With top-tier controls and comfort features, you can command your vessel with ease and relaxation. Various accommodations include flip-up bolsters, armrests, digital throttles, joystick controlling, and a plethora of space for your choice of devices. 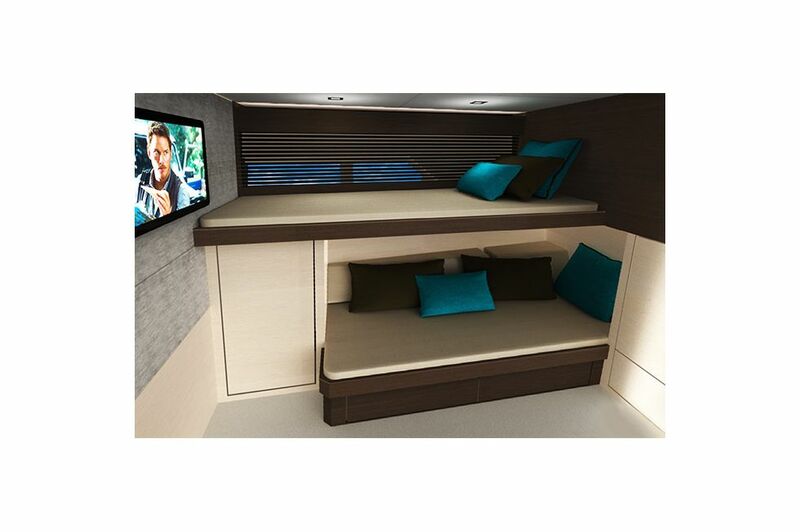 Experience the breathtaking sights of the horizon while relaxing indoors with the 54 Fly Upper Salon. 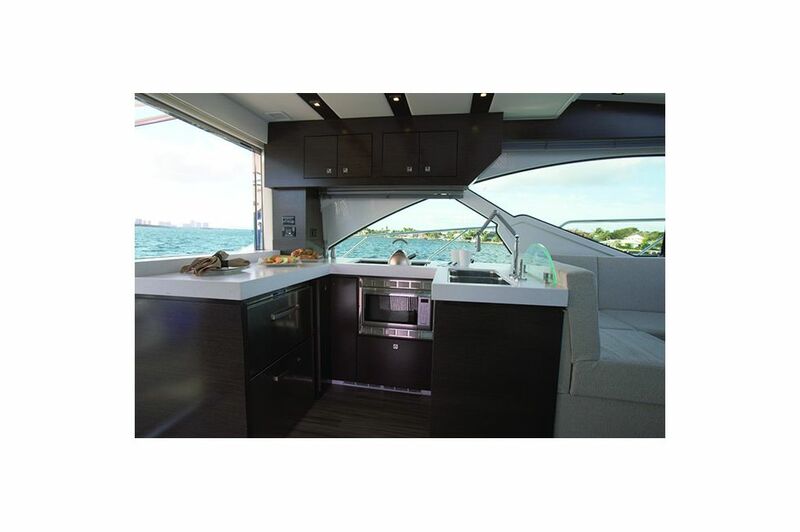 With truly unique design, the Upper Salon features a complete 360* view as an open-concept galley, dinette, and helm. With retractable windows, you can still take in the crisp sea air while lounging inside with friends. 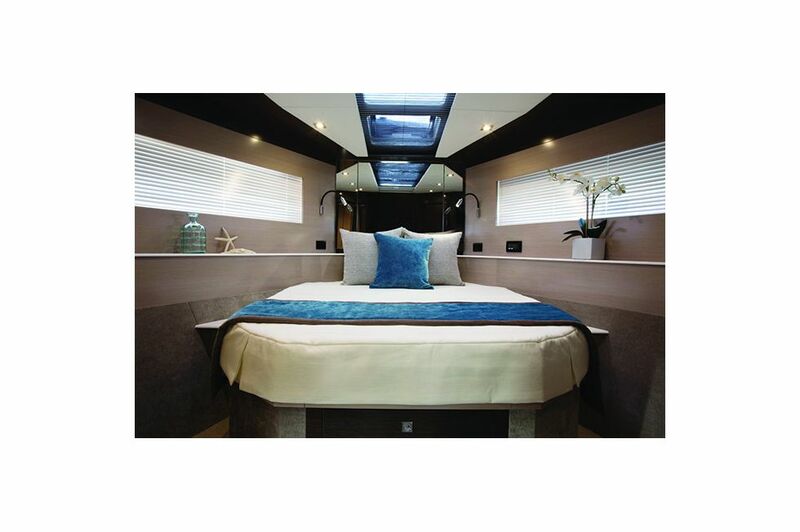 Sink into the relaxing and versatile Lower Salon of the 54 Fly. Featuring plentiful natural light from the hull windows, a lavish sofa, and retractable TV, the Lower Salon is the perfect, serene place to revitalize yourself before returning to the party. Dream kitchens don't just exist on land. 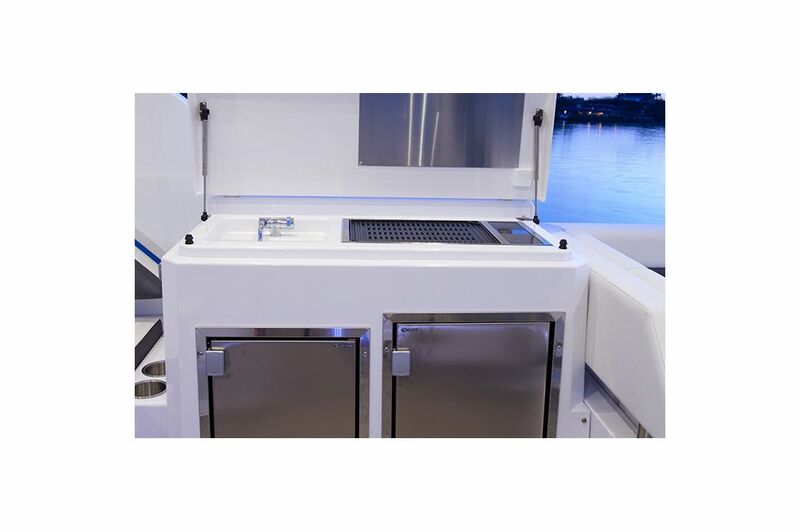 The 54 Fly galley is efficiently crafted and positioned for ideal functionality while entertaining so you can stay in the conversation while you utilize the all-encompassing kitchen to prepare hors d'oeuvres and refreshments. From the dishwasher and microwave to icemaker and cooktop, the 54 Fly kitchen can prepare anything on your menu. 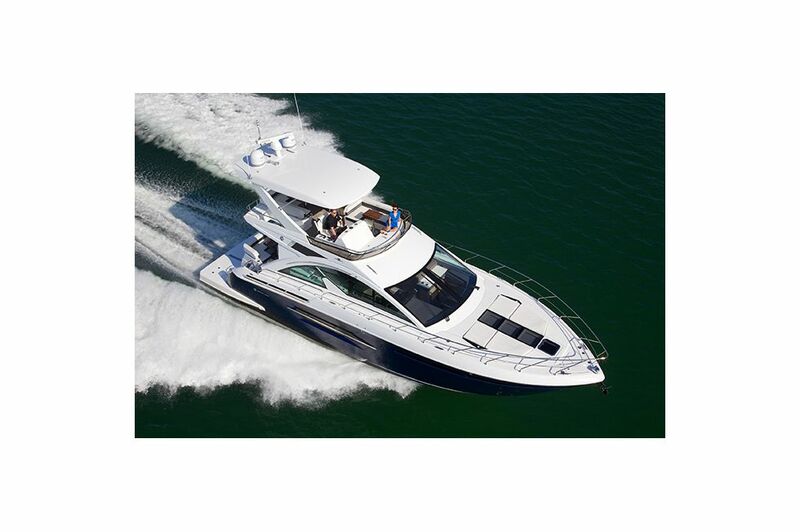 Retreat into ultimate comfort and extravagance after a long day of cruising. Ease into the tranquil, private Master Stateroom to Zen out and enjoy a complete array of amenities for your convenience, including a walk-around island berth with café table, two built-in seats, nightstands, a vanity, and spacious storage. 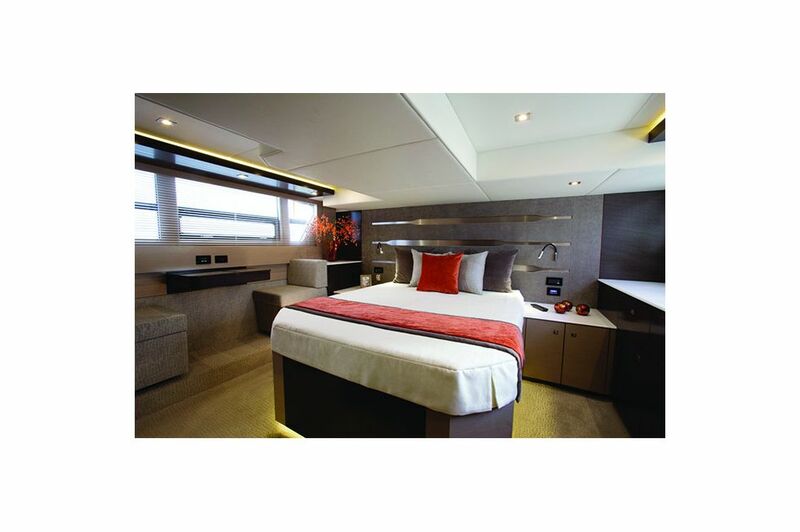 Treat your guests to a truly exceptional overnight stay on the water with the VIP Stateroom. 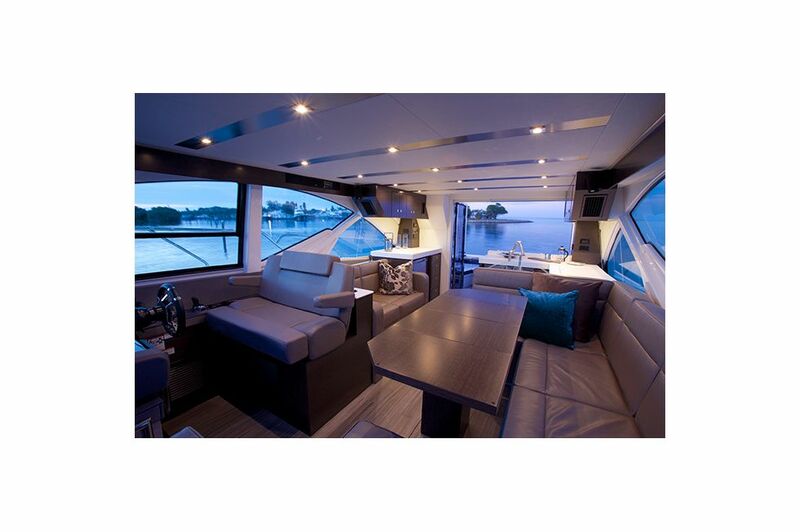 Slipping into the walk-around queen berth while taking in the sunset through the panoramic windows will give your guests the weekend escape they've been longing for. 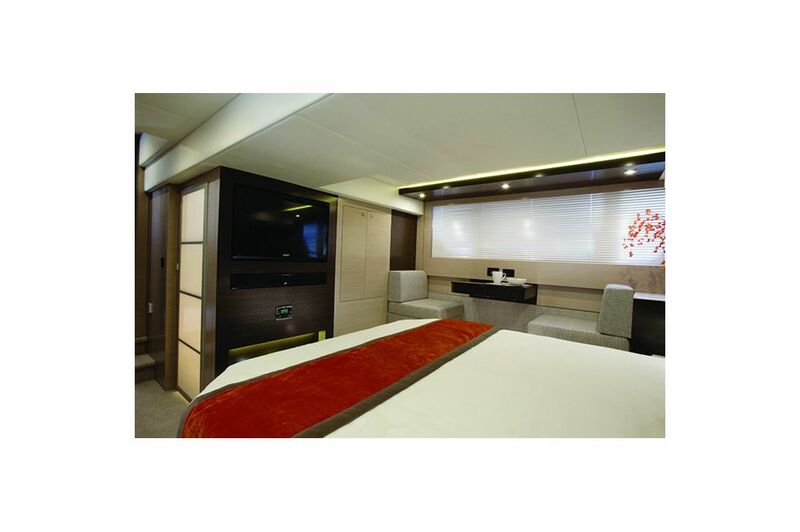 Transform your Master Stateroom into a private, paramount Master Entertainment Room. Draw the blinds and turn up the volume with the click of a button to be transported into the plot of your favorite movie or verse of a beloved song. 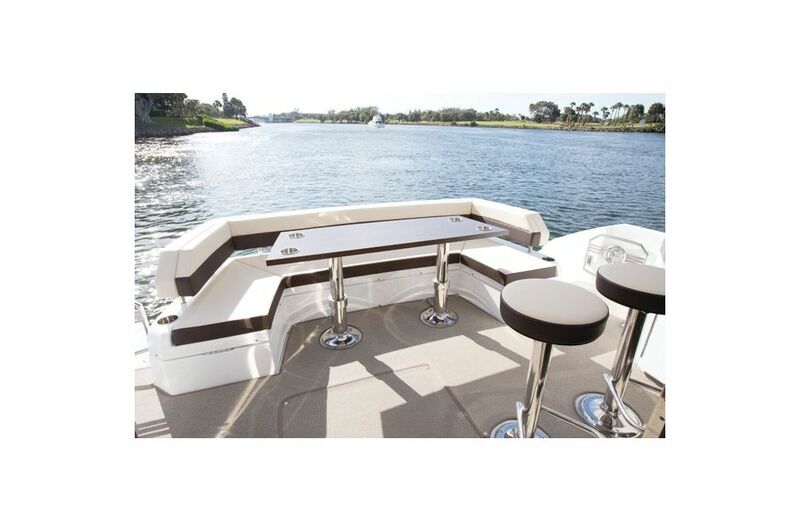 With a built-in TV and state-of-the-art audio system, escape into your favorite media while cruising the open water. Simple. Smart. Stylish. 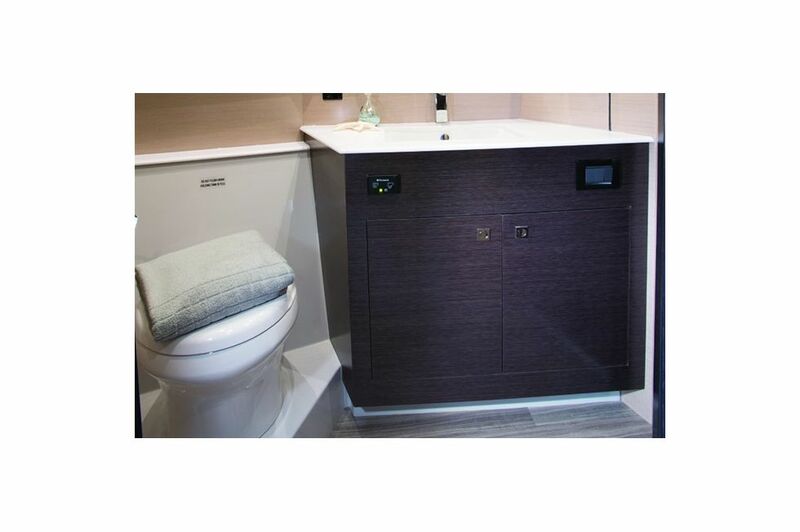 The 54 Fly Head features the necessities you require on the water, including a fully-equipped sink, toilet, and storage, in a classic, convenient design. Contemporary style meets optimum efficiency in the Master Head. 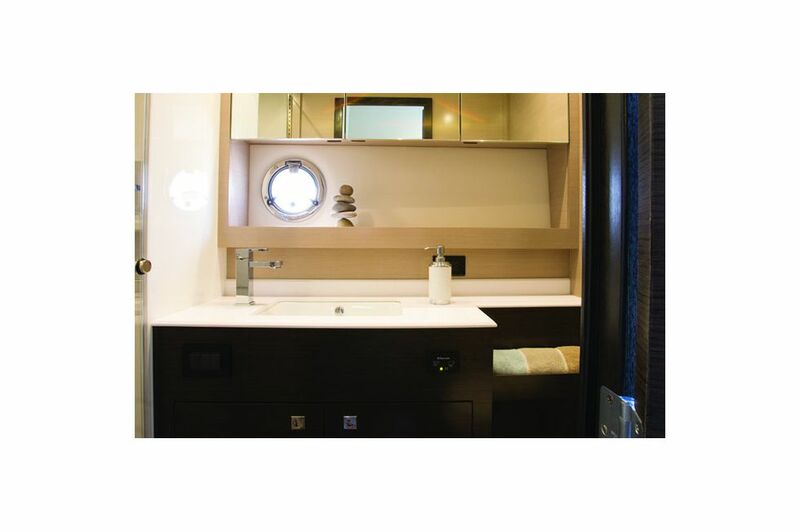 Matching the convenience and luxury of the Master Stateroom, the Master Head features sleek and artful lighting, designer fixtures, and wood detail as well as a full-standing shower, vanity, and expansive mirrors for your ease. Enjoy this perfect combination of function and flair. 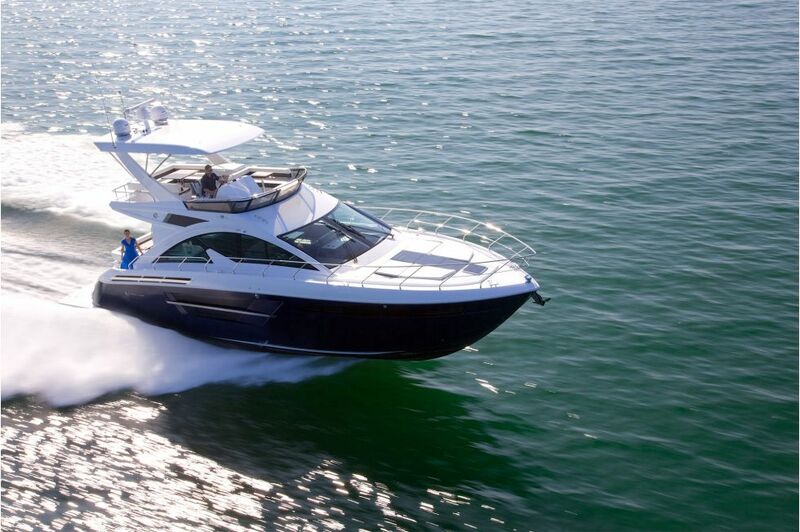 Relax in the ultimate space all other boats bow down to. Bask in the warm sun and enjoy a front-seat view from the pop-up lounge chairs of the vast horizon in the 54 Fly Bow Lounge. The sun may set on the horizon, but it doesn't have to on your get-together. 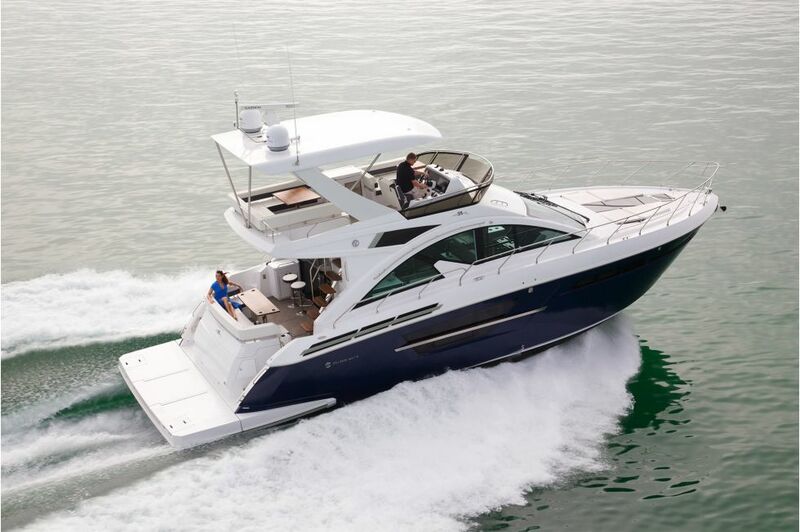 With the 54 Fly, the days of docking at the end of the night so your guests can retreat home are a thing of the past. 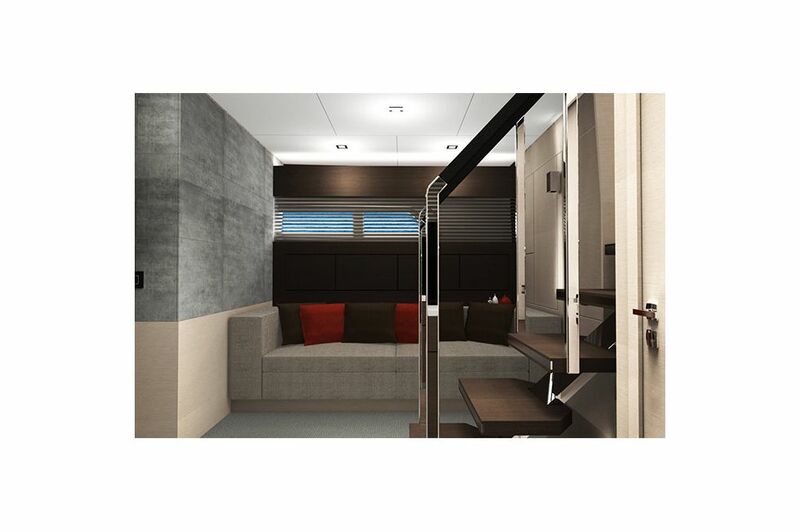 With a Third Stateroom onboard, your guests can stay aboard for a comfortable and convenient slumber, featuring a wide hull for natural light, spacious dual bunk beds, large TV, and additional storage for a truly luxurious slumber party. Onboard meal preparation has never been easier. The 54 Fly Grill is compact yet large enough to grill up any dish your taste buds demand for the entire party.